WorldMovieStore - Shakespeare in Love Sinopsis. When Will Shakespeare needs passionate inspiration to break a bad case of writer's block, a secret romance with the beautiful Lady Viola starts the words flowing like never before! There are just two things he'll have to learn about his new love: not only is she promised to marry someone else, but she's successfully impersonating a man in order to play the lead in Will's latest production! A truly can't-miss motion picture event with outstanding critical acclaim to match its impressive collection of major awards -- everyone will love this funny behind-the-scenes look at the writing of the greatest love story ever told! Read More Sinopsis. 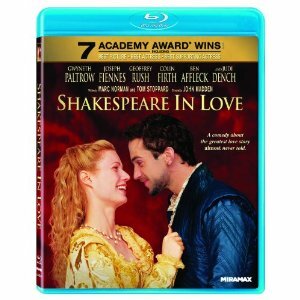 0 Response to "Blu-ray Release Shakespeare in Love"